Action cameras are all the rage at the moment. Having just reviewed the Dazzne P2, I was very interested to receive this very similar camera which was proposed to me by the vendor for evaluation. While the two cameras are very similar in appearance, there are some significant differences. In my opinion, the quality of images in both video and still photo modes is very good but somewhat inferior to the Dazzne. The video is quite acceptable, and the camcorder has a shake-attenuation feature available, but the still photos are more difficult to focus, despite the lateral buttons which control zooming in and out. The final result can be quite grainy, until you get the hang of all the different settings, whereas the Dazzne has an excellent default auto-focusing function. The fish-eye effect is also marginally more pronounced in photos taken with the DBPower in relation to the Dazzne. The other difficulty is that the rear screen is far too small to allow for accurate focusing. It is very useful, however, to change parameters and generally frame the shot. Since this camera is designed to be attached to moving bodies, whether on a helmet, handlebars, or similar, framing the shot is likely to be random anyway. 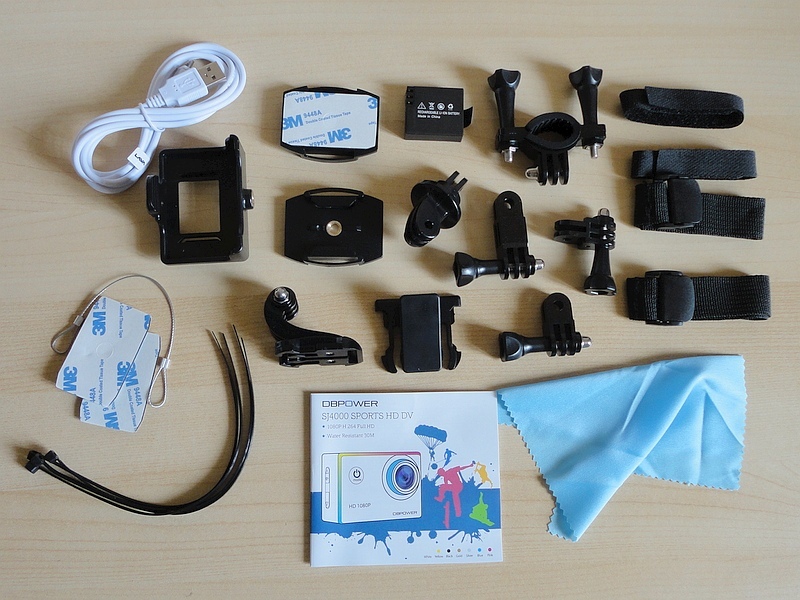 The mounting accessories are excellent, allowing the camera to be secured to a helmet in various positions (top, side), handlebars, a belt, and a tripod. The Dazzne has even more mounting options, notably a chest harness and windscreen mount, which are available for the DBPower as extras. 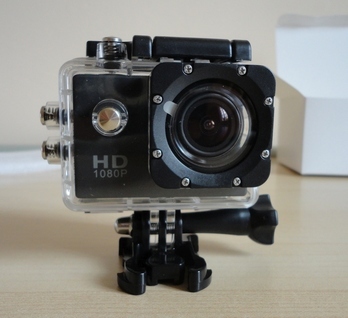 All GoPro accessories are compatible with the DBPower, which is a great advantage. Two batteries are included, rechargeable via a USB cable (the Dazzne has a mains 2-bay dedicated charger) and changing them is very easy. Each one gives an autonomy of well over an hour, and up to 70 minutes. The USB cable also allows media downloading to a computer which is extremely easy as the DBPower is recognized as an external drive, in the usual way. We tested it successfully with Vista and Win 8.1. The manual in English and German is clear enough but not very detailed. It does include photos illustrating the various mounting options. Fortunately, operation is intuitive for anyone with some familiarity with similar devices, and a little experimentation will allow you to get going very quickly. 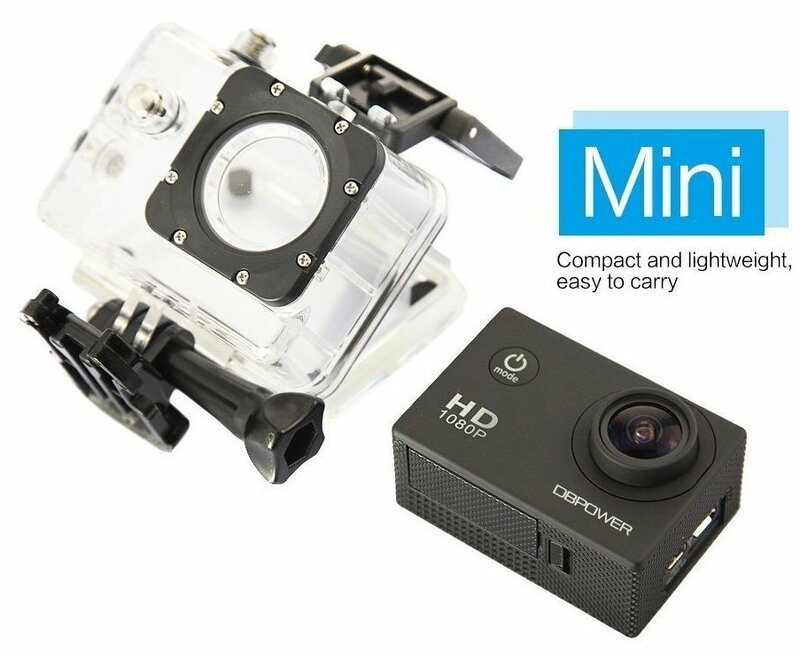 In summary, this is a very capable action camera offering very good value for money. It does everything a good sport camera should do for a price which is a fraction of the market leader's. It's great fun to use and, because it's not that precious, you will find yourself using it with abandon. My rating is 4.5 stars, but since that is not allowed on Amazon, I will round it down to 4 because of the lack of memory card, smaller battery capacity and fewer accessories.